There is increasing number of retailers who rely on cloud data analytics to understand customers’ psyche and accordingly create new product designs or provide offers on existing products. Cloud data analytics from various sources such as search engines, social platforms, or e-commerce providers can provide meaningful insights in understanding customer behavior and design actionable for greater sales volumes. Reliability of cloud data eliminates guess-work associated with what products or offers would be readily accepted by consumers. It is easy to capture new fashion trends or styles to plan new product designs that are bound to be appreciated by consumers. There are several retail chains that have already started implementing cloud based inventory management systems either in a private or public cloud environment. These enterprises are able to gain real-time insights about status of inventory at any store or stock-point for efficient management of stock refilling, movement of stocks, or order tracking, and so forth. Thanks to automation of inventory management systems with help of cloud computing solutions, sales and marketing staff can focus their efforts on growing sales through enhanced customer satisfaction. Natural calamities or unexpected events may lead to closure of business operations. Cloud based disaster recovery is the most reliable resource for maintaining business continuity in spite of disasters such as floods, tornadoes, earth-quakes, fire, and snow-storms to name a few. Natural calamities or unexpected events may lead to closure of business operations. Cloud based disaster recovery is the most reliable resource for maintaining business continuity in spite of disasters such as floods, tornadoes, earth-quakes, fire, and snow-storms to name a few. Cloud Disaster Recovery leverages remotely located cloud data centers to support business functions if these are impacted by any act of God. Disaster Recovery services use cloud storage facilities to secure mission critical apps as well as data to protect ongoing business operations and help enterprises restore normal business functions. Effective marketing campaigns need to match consumers’ expectations in terms of medium of communication. Relying on print media to target modern consumers who are not going to reach for newspapers or tabloids for accessing information can prove to be a costly mistake. In order to achieve a desired impact of marketing campaign, retailers need to focus on mobile based communications while targeting modern tech-savvy consumers. Cloud based communications can be leveraged by employing a wide spectrum of channels including social media, e-mail, websites, online blogs, and other forms of text messaging to name a few. 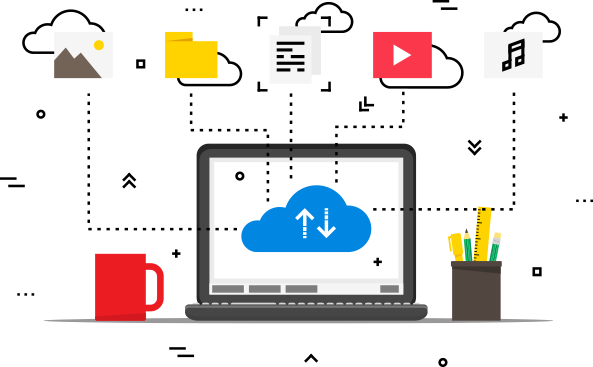 Cloud has excellent ability of collecting and analyzing huge data volumes that are generated via multiple sources. These analytics play vital role in designing communication strategies to promote merchandize to right customer at the right time. Cloud computing helps retailers eliminate upfront costs of developing hardware intensive infrastructures. Cloud models need limited investments and can be tested in real-time by involving existing target audience. Moreover, the fear of getting locked-in is also absent due to short-term agreements with cloud service providers. Retailer can easily migrate to more rewarding solutions without any risk of penalties or loss of investment. Retailers stand to gain at the end of the day as cloud computing encourages healthy competition among service providers. Cloud computing continues to attract retail industry by offering innovative benefits that are measurable and cost effective. Retailers are leveraging cloud solutions for enhanced visibility and effectiveness of supply-chain resources.